These witty totes can keep a whole bottle of wine under wraps! 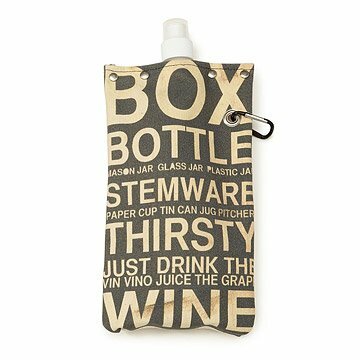 The canvas body of the water, juice, or booze-bearing bags is sewn by hand and on a machine by a USA-based collective of artisans. Illustrator Michel Stong's snappy graphics are silk screened onto the material for an additional dose of personality and high-design charm. The BPA-free, recyclable, and washable liner blocks UV rays to insure the longevity of the contents, even when you're catching rays on the beach, hitting the trails, or picnicking in the park on a sunny day. Unlike bottles, thermoses, or canteens, these totes can roll or fold up when they're not in use, making them ideal for day-trippers, campers, bikers, and backpackers. Style, function, portability, and charm all in one design? We'll drink to that! Assembled by hand in the USA. Rinse liner with soap and water or use a bottle brush. Wash exterior with soap and water or fabric spot cleaner and let air dry completely. Perfect for Drinks on the Beach! With the summer coming up and the weekly beach concerts on the horizon, I wanted to get my Mom a beach friendly container for her Pinot Grigio. This tote served perfectly! It stores just enough wine for a good time and is easy to clean after. For you close drinkers, this tote has an attractive that could easily pass as just a water canteen if you're trying to keep it on the DL. Got as a gift, hope she likes it! These witty totes can keep a whole bottle of wine under wraps!